If you’re a parent, you know how daunting those first few months are, not to mention exhausting. Many of you work with new mothers in the maternity ward, doctor’s office, etc. Wouldn’t it be helpful to offer more education about SIDS and how to care for a newborn? The Baby Box Co, Cooper University Hospital and several other facilities in NJ have teamed up to save infant lives in New Jersey. It's quite an interesting idea this baby box, and because it's educational, the hope is it will increase safety for newborns. Sounds like a wonderful and welcome idea for new mothers and fathers. We hope it will spread across the U.S. and reduce infant mortality. A statewide safe-sleeping campaign featuring free cardboard "Baby Boxes" rolled out Thursday at Cooper University Hospital, part of the newest effort to reduce the number of infants dying from Sudden Unexpected Infant Death Syndrome (or SUIDS). New Jersey is the first state where all expecting and new parents can receive mattress-lined boxes and infant care supplies from The Baby Box Co. after completing an online parenting education program through its website, babyboxuniversity.com. Finland introduced baby boxes, along with prenatal care and parenting education, as a way to decrease its infant mortality rate, from 65 deaths per 1,000 births in 1938, to 1.3 deaths per 1,000 births in 2013, according to the World Health Organization. That country's work inspired Jennifer Clary and Michelle Vick to launch The Baby Box Co. in the United States. According to its website, Baby Boxes serve families in 52 countries. "I think we have a very special product, but it's only special because of the way we distribute it," Clary, the CEO, said. "Early parenting education is linked to infant mortality reduction. That's what we focus on." The New Jersey program expects to distribute about 105,000 boxes this year. In South Jersey, the boxes will be distributed by Cooper University Health Care and Southern New Jersey Perinatal Cooperative, among others. Parents also can choose to have the box delivered to their home. Made from sturdy cardboard, the boxes can be used as a bed for the baby until 5 or 6 months of age. The supplies include diapers, wipes, a onesie, breastfeeding supplies and other items, valued at $150. The program was introduced by New Jersey's Child Fatality & Near Fatality Review Board, using a grant from the Centers for Disease Control. The review board examines deaths and near-deaths of children to identify causes and ways to prevent future deaths. While unsafe sleeping practices don't account for every case of SUIDS, parental education can help eliminate preventable deaths, said Dr. Kathryn McCans, an emergency department physician at Cooper who also leads the review board. "Unsafe sleep is a significant cause of SUIDS in our state and likely in every state," McCans said. "Based on national data, New Jersey fares pretty well, as far as the rate of SUIDS death, but our rate is still high enough that it results in 50 to 60 deaths a year that seem to have at least unsafe sleep associated with it, even if it wasn't the full cause." Factors associated with safer sleep include a firm mattress and a bare crib with no blankets, pillows, bumpers or stuffed animals in it; no smoking or substance use during or after pregnancy or by anyone in the household; exclusive breastfeeding during the first six months of life or any amount of breastfeeding possible. "This program, at its core, is about getting education out to parents in a form that younger parents really love," McCans said. Cooper doctors and health experts in New Jersey helped the company create educational videos for expectant parents on topics like installing car seats, safe sleeping practices, breastfeeding resources and support, and fatherhood engagement. Two Camden families were the first to receive their boxes Thursday. Dolores Peterson popped her 5-week-old daughter into a cardboard box lined with a mattress, as cameras recorded little Ariabella Espada's reaction. Peterson, a first-time mother, said she plans to tell her mothers group about the program. "I'm going to let every mother know to sign up and get a box," Peterson said, so their babies can sleep safely, too. 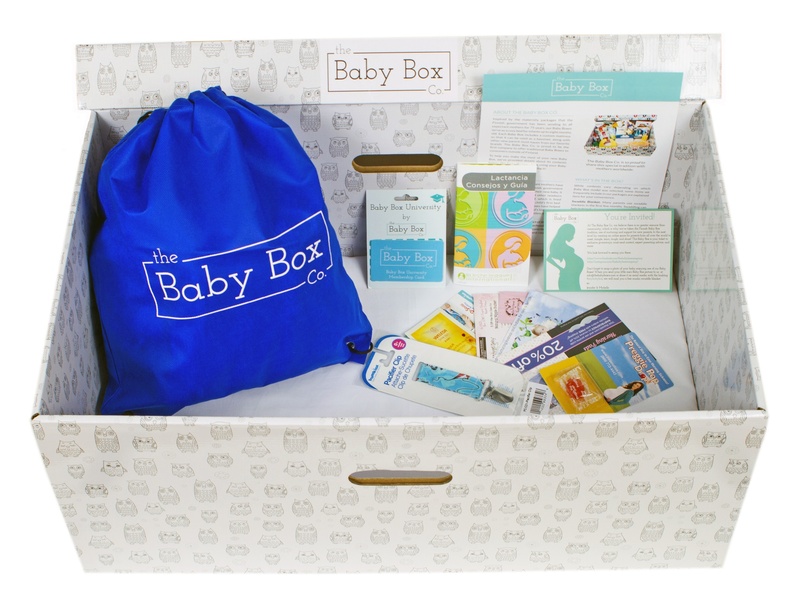 To receive a free box, New Jersey parents can register for free online at babyboxuniversity.com. After watching a 10-15 minute program and taking a short quiz, parents can choose how to receive their box.